Jill Of All Trades: A balanced diet or a crash diet? A balanced DIET will not make you feel like DIE-ing. Whereas a crash-diet will be a torture, leaving you wishing that you weren't born. At least a true foodie like me would. I am a new mom and the post pregnancy baby weight refuses to go. How would it, I am unable to remove time for intense exercise, the most I manage is some walking. And I have no control on what I eat. Pizza, Burger, Fried, Cakes; once it comes in front of my eyes, there is no stopping me. Almost as if I am still pregnant and free to eat how much ever I want. 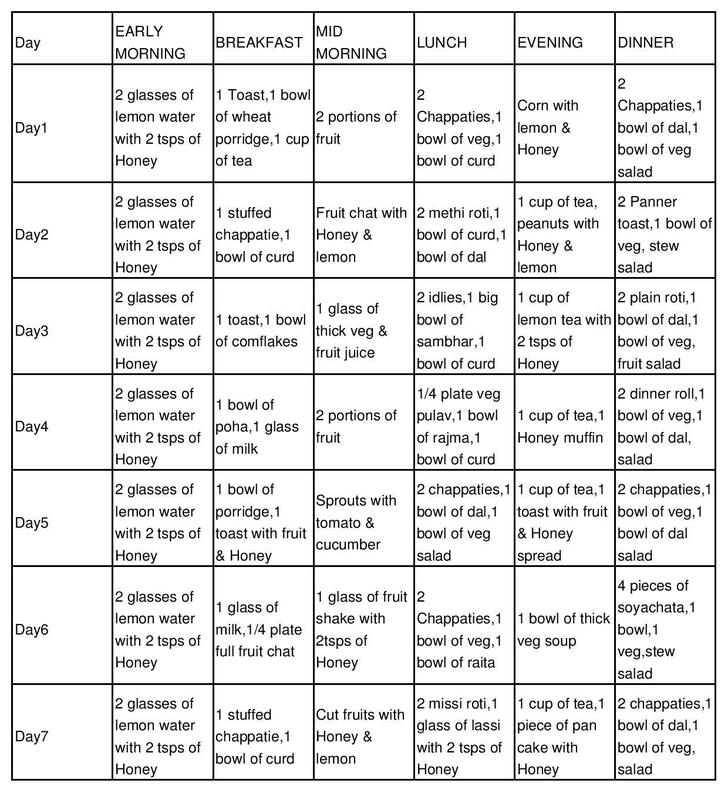 To help me start towards my slow but steady progress towards fitness, I got a diet plan all thanks to Dabur Honey. They have this take 3 clicks diet planner in which you enter basic details like age, BMI, calorie intake, level of physical activity and it will give you a 7 day diet plan. This looks pretty easy to follow to me! I start my Honey Diet from tomorrow, I already have a bottle of Dabur Honey and complete determination ready at my disposal. I have heard of rave reviews of people who have a glass of warm water with lemon and honey. It helps with the digestion and metabolism if I'm not wrong. And honey is definitely a vital part of the diet, it can replace the sugar intake a lot. I have already replaced my 4 O' Clock tea with green tea with honey. A crash diet will probably last a few days, max a week and take of some water weight. But on the long term a well balanced diet consisting of green vegetables, pulses and loads of liquids will work wonders. And a sinful treat here and there is not all bad as long as you stick to your limits. So have one bite of that chocolate cake or 2 spoons of ice-cream instead of hogging on the entire thing. Another issue with me is taking time out to exercise. With a baby in the house, and being back to working I hardly get the time. And sometimes, like on a weekend if I get an hour I am seduced by sleep, that power nap seems more important than exercising. But recently I read an article, and that has come to my rescue. It says that stop trying to take time out to exercise, instead do it impromptu in every short break you get. So say every other hour take five minutes to do squats, lunges, hopping, skipping, stretching or whatever else you can think of. Even if I do this 6 times in a day, I am practically doing a 30 minute workout which I otherwise was not able to remove time for. Magical indeed! Now with this new plan with the diet and exercise, I am sure in a few months results will start to show. Will definitely update with the same. If you're reading this and have any suggestion that worked for you, please do tell, I'm all ears!